Reflecting on Scaffold got me thinking about fairness and Son of Sam laws, laws, Wikipedia says, “designed to keep criminals from profiting from the publicity of their crimes.” Some will bristle at an analogy that implies criminality of Scaffold artist Sam Durant or the Walker. It is jarring. The United States has two original sins: Native American genocide and slavery. Those include horrendous crimes of theft, abuse and murder. Regardless of whether most of us reject these crimes today, the truth is this nation’s wealth was built on historic (and ongoing) injustices. White people today (including artists and bloggers) are accomplices after the fact. We benefit from this wealth and privilege but have done little if anything to honestly address these crimes. Back to Scaffold: Is it fair for white artists or institutions to profit from images based on these historic crimes — in this case the hanging of the Dakota 38 — without so much as a conversation with those who have suffered its legacy? The concept behind the Son of Sam laws says no. Let’s make it a bit more personal. Let’s say someone killed your family then got acquitted for the murder. Then other people wrote about your story and made a movie about it. Would it feel fair to you if they never talked to you, got the story wrong, and made millions of dollars while you were broke, homeless and without your family? Fairness is a core value and one that can be weighed against artistic freedom. I believe the Walker wants to create a welcoming space in the Sculpture Garden. The Walker, and even more broadly our democracy, values inclusion — bringing all voices to the table. 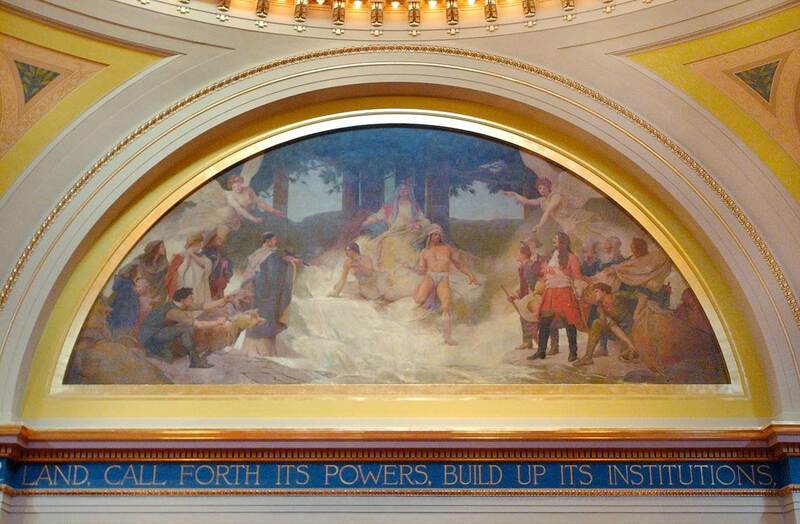 Minnesota State Senate mural: “The Discoverers and Civilizers Led to the Source of the Mississippi” shows an attempt to convert half-naked Native to Catholicism. It’s removal never got serious discussion. Scaffold created a very unwelcoming space in the Walker Sculpture Garden for Dakota people and those who care about their stories. Its very presence would have made it difficult for Dakota people to go and enjoy a picnic in the Garden, which is a public park. 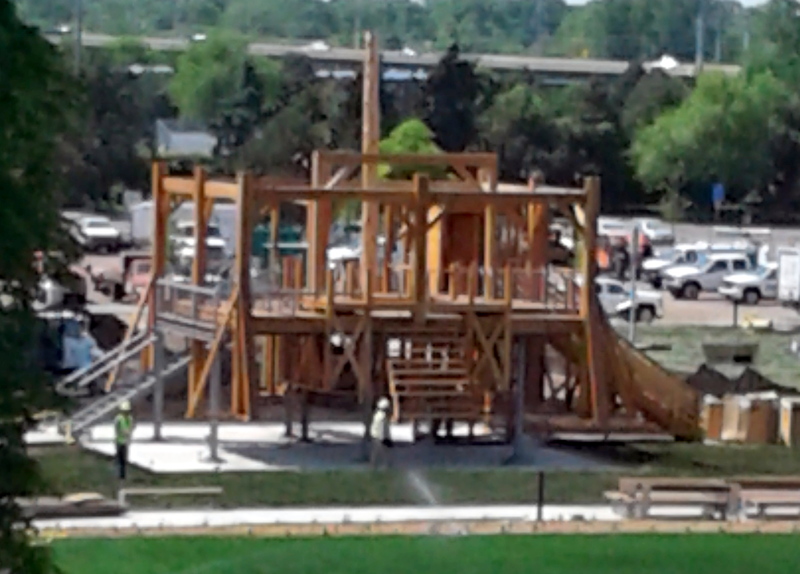 Scaffold raises a similar issue as the Minnesota State Capitol art controversy. There was, and remains, art in our Capitol that depicts Native Americans as savages. That art, by its very presence, can make Native people and their allies feel unwelcome and angry. If Native people want to go to the Capitol and exercise their basic rights as citizens, they are forced to put up with these offensive images. This issue is bigger than Durant, the Walker and the state Capitol. It raises larger questions of what stories we tell in our public spaces and how we balance values such as inclusion with artistic freedom. Repentance — the ability to express sincere regret when you make a mistake and correct it — is not a uniquely Christian value; it is held by Jews, Muslims, Buddhists and others. Repentance is not a word the Walker used in describing its decision to remove Scaffold, but, in a secular way, it gets to the core of what the Walker did. Some commentators criticized the Walker’s decision as a retreat from artistic freedom, a caving in to public pressure. But I take Olga Viso, Walker’s executive director, and Durant at their words when they apologized. I don’t think they turned their backs on artistic freedom at all, I think they simply acknowledged a mistake and tried to make it right. They didn’t reject artistic freedom, they acknowledged in this case the art was ill-informed. It is possible for the Walker to deeply value artistic freedom yet at the same time find fairness, inclusion, and repentance to be overriding values. The bigger point is that we as a nation are unaware of the stories of marginalized communities and the pain they experienced, each in their own way. That leads to ill-informed decisions. When people from marginalized communities speak their truth, pain and anger about these decisions, institutions have a choice to make. Like the Walker, they can acknowledge the error and open the doors to the possibility of healing. Or, like state leaders decisions on Capitol art, they ignore the error and choose to continue the pain. For more background on this story, see the Walker Art Center tab on the blog.